I am a person who believes in "eat little when you are hungry every time". So I would prefer 5-6 half meals than just 3 square meals a day. I keep munching yummy stuff when ever I feel hungry. The quantity and quality of food matter when it comes to this kind of eating habit. So here is a really interesting fried snack made out of pumpkin, for one to enjoy in the evenings. Believe me, its not oily and is absolutely lite and easy to digest snack. Adding a vegetable to a fritter makes it healthy as well. :) They are so soft and yummy. Soak the par-boiled rice in hot water for 2 hours. Now grind pumpkin pieces, coconut, red chilies, tamarind paste, asafoetida, salt and jaggery together into a thick paste in a mixie without adding water. Now strain the rice and grind it along with the above paste using grinder into a thick and smooth batter. Do not add water at all. Once done transfer the batter to a bowl lined with a thick cloth. Now tie the cloth and keep it aside for 15 min till the cloth absorbs all the moisture from the batter. Add a spn of oil in a pan and splutter mustard seeds. Add this to the above batter along with finely chopped curry leaves and mix well. Now roll lemon sized balls from the batter and press in between two greased plastic sheets to make a flat round of 3mm thickness. Make a hole in the center with your finger. Gradually remove it from the sheet and deep fry it oil, roasting it on both sides. Do not over roast. The vadai should be really soft. Now place them on tissue to remove excess oil. Wonderful n yummy recipe.. 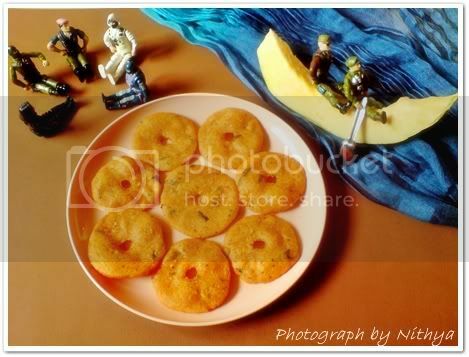 Awesome presentatin..
Pumpkin vadai looks crunchy and yummy!!! Beautiful clicks. Vadai sounds very interesting and very crispy..
nice vadai and Excellent presentation...good job. Cute presentation...Fritters looks so perfect and yummy!! Looks crunchy and yummy Nithya. Nice clicks. Interesting recipe ... will try this !!! I have used pumpkin in several dishes but have never fried them. sounds good. Nice innovative recipe.......love the colour too.Congrats!!!!!!!! Pulla vadai is looks so yummy nithya.. my best favorite vadai. My mouthwaters looks so tempting. 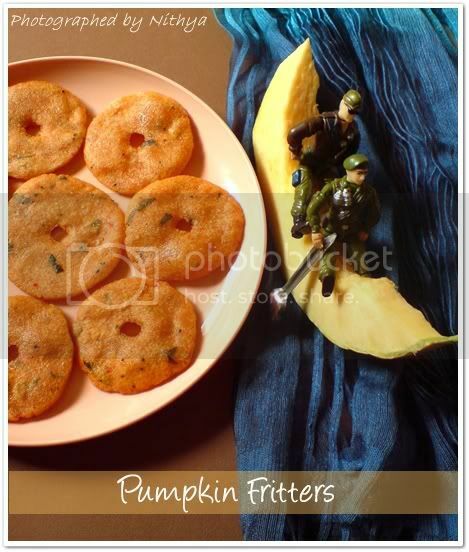 Pumpkin vadai looks crunchy and awesome, very interesting fritters..
pumpkin fritters.. looks very appealing..btw love the presentation with the lil J.I.Joes..we would like to pass on the Sunshine award, please stop by to collect it. Vadai sounds very intresting.. Crispy and yummy.... Nice presentation..
as usual presentation rocks !! 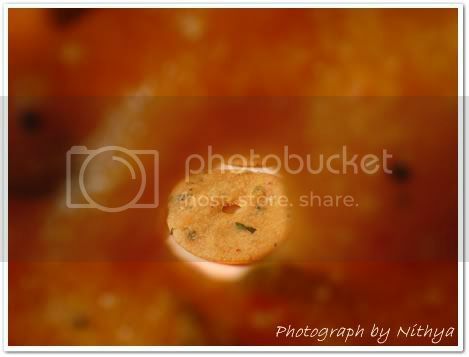 Yummy and delicious vadai..intresting and tasty!! 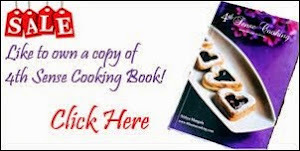 lovely new and an innovative recipe.the vadais look very tempting and inviting. Love the pumpkin fritters dear. Very new to me. 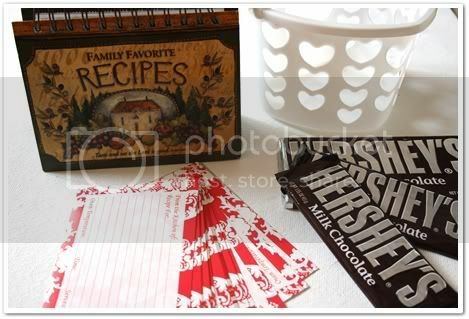 Yes, a healthy indulgence.Congrats on your gift basket. Lovely! This looks very innovative and so is your photography. Looks very crispy and yummy indeed. I completely agree..there has to be something around for munching all day! Wow so glad to have found your blog, I am your new follower. I invite you to visit my blog too, I am new at blogging. 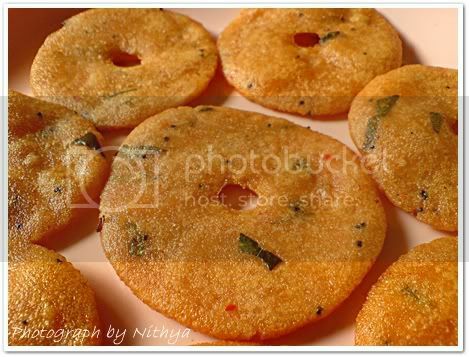 poosaniai vadai quite a new recipe..And as usual awesome cllics.will try it soon. This is new to me.. and loved the snap where you clicked the other fritters through the one you are holding ! Vada luks perfect snack... i am happy i gave the prize before the next diwali arrives..
Yummy and healthy vadai and what a click!!!! Beautiful!!! I liked the Vadikul Vadai Photo!!!! Fritters look delish, N. Loved the bowl from the gobi post. Those vadais are looking so cute first of all,and sounds good too! COngrats on winning the give aways ! Fritters are looking amazing nits,the pics are so adorable.This recipe is new to me,have n't tried more recipes with pumpkin. Sounds interesting. Congratulations for the win and gift. nice click from u as usual Nithya ..
Looks more like thatai...epdi iruntha am sure they wud be a great snacky for teatime! wow! fritters with pumpkin(which is my favorite )?Never heard it before...nice presentation as well.Bookmarking recipe..
what a wonderful-looking and tasty fritter! I would love to eat it and am going to have to make it soon!